As studios in South Texas begin to dig out from the damage caused by Hurricane Harvey, the dance community has a message: We're here to help. Gil Stroming, owner of Break The Floor (which produces epic conventions like JUMP and Dancer Palooza), has pledged to donate $25,000 directly to studio owners directly affected by the storm. On top of that, he will match dollar-for-dollar the next $25,000 donations in a fundraiser he's hosting on GoFundMe. Commercial dance celebs like Misha Gabriel, Al Blackstone and Kirsten Russell have already pitched in with donations of their own. The campaign has already raised more than $37,000 in just four hours. Anyone is invited to add their donation here. 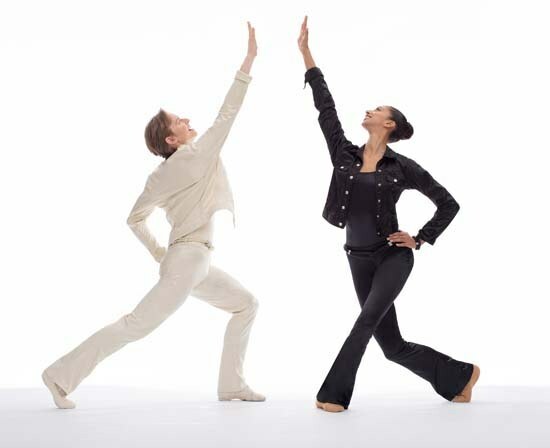 The pair take on Judith Jamison and Mikhail Baryshnikov’s roles in Alvin Ailey’s Pas de Duke. Simkin and Mack in costume for Pas de Duke. Photo by Jade Young, Courtesy YAGP. If any two dancers could generate the buzz of Judith Jamison and Mikhail Baryshnikov, the original couple in Alvin Ailey’s flirtatious Pas de Duke, it might be Ailey’s own Alicia Graf Mack and American Ballet Theatre principal Daniil Simkin. The duo will bridge the worlds of ballet and modern dance—as Ailey intended when he made the duet in 1976—at the Youth America Grand Prix gala, April 10 at Lincoln Center. Siobhan Burke caught up with Mack and Simkin while rehearsals were well underway. How did you end up dancing this piece together? Daniil Simkin: I actually suggested it to Larissa Saveliev, the co-founder of YAGP, and she was like, Totally, we’re going to make this work, and I want you to partner Alicia. Why did you suggest it? DS: I’m always looking for new things to try. It’s a challenge, because, I mean, it’s Ailey, it’s an iconic piece, and especially because Mikhail Baryshnikov and Judith Jamison first danced it. Alicia Graf Mack: While it’s very dance-y and jazzy, it’s still extremely technical. So you can have a good time, but you’re thinking, Okay, I gotta execute this. Also, it was designed to be a play on the classical pas de deux, but it’s not supposed to be a satire; it’s not supposed to be funny. That’s a challenge, because you have to walk a thin line between entertainment and comedy. DS: It shouldn’t look cheesy or cheap. AGM: Yeah. Class. All class. Coming from different companies and backgrounds, how is dancing with each other? DS: I have a lot to learn. The first series of hip rolls is my favorite step. It might be the simplest in the whole piece, but for me, it’s the hardest. When Baryshnikov danced it, he said that he felt like a cow on ice. The groundedness, the use of the hips. It’s a different kind of coordination. So I watch Alicia not to imitate her, but to really get at what she’s doing and make it my own. What is it like to perform at a YAGP gala? DS: The kids are so enthusiastic. There’s a lot of screaming [laughs]. Sometimes it’s like there’s a storm coming. AGM: The first time I did a YAGP gala I was starstruck, just looking around and thinking, I can’t believe I’m taking class and performing with these people I’ve admired for so long. Like, Wow, I feel like I’ve arrived.